Giardiasis is an illness caused by a parasite called Giardia intestinalis. It lives in soil, food, and water. It may also be on surfaces that have been contaminated with waste. You can become infected if you swallow the parasite. You can also get it if you're exposed to human feces (poop) through sexual contact. The risk of getting giardia is higher for travelers to countries where it is common, people in child care settings, and those who drink untreated water. These symptoms may lead to weight loss and loss of body fluids. Some people have no symptoms at all. Symptoms of infection often last two to six weeks. Stool sample tests can diagnose it. You often need to collect several samples to test. Doctors use several drugs to treat it. The best way to prevent giardia infection is to practice good hygiene, including frequent hand washing. You should not drink water that may be contaminated. 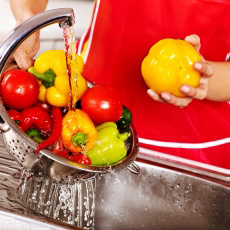 You should also peel or wash fresh fruit and vegetables before eating.